This Sunday (February 7), a sale of a fine selection of art works from a variety of comic artists: Hergé, Franquin, Aidans, Attanasio, Funcken, Haussman, Ribera, Uderzo and many others is to go under the hammer. Naturally these include some pieces of Hergé's Tintin, most notably a set of story boards from the story of King Ottokar's Sceptre. This is estimated at up to €2,000. 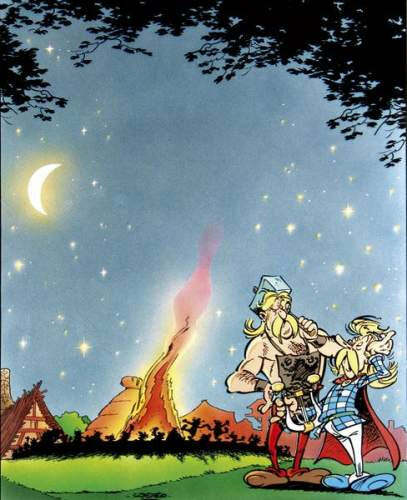 Even more covetable is a colour picture by Uderzo of a classic Asterixian scene with tuneless bard Cacofonix standing with his nemesis the blacksmith Fulliautomatix some distance from a village banquet. This is estimated at up to €3,000. But the star of the show is definitely Grzegorz Rosiński, the Polish artist, and his illustrations of Belgian comic book Thorgal. Several images from the comic are on offer, but the expected top lot is one of the hero alongside his son, Jolan which is expected to bring up to €25,000. The exciting sale takes place at Kahn-Dumousset, Paris.